Shady Brook one BEDROOM ALPINE COTTAGES and gardens; are magnificently furnished. Each bedroom has a queen sized bed in a separate room with a ceiling fan, electric heating/cooling, separate bathroom and a spacious lounge (each cottage has a fold out double sofa bed in the lounge) and kitchenette. Set in a private garden with a deck and barbeque with your own outdoor setting. 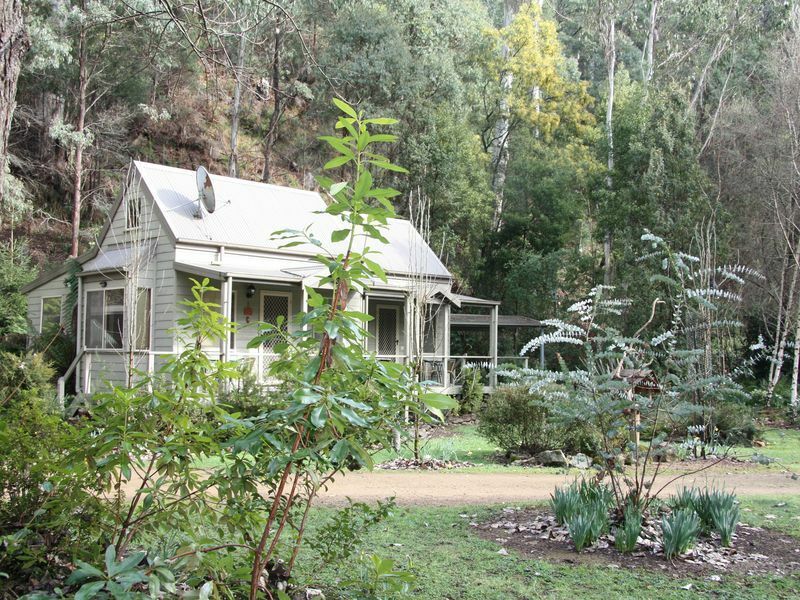 Both cottages are only 30 metres from the river and are very secluded, with private bush tracks immediately at rear of the cottages. There are 2 one bedroom Cottages available and a1 two bedroom alpine deluxe cottage and a two bedroom apartment available at Shady Brook. Unique Anne and I (john) are passionate about Shady Brook. We believe we have develop a magnificent garden in a very unique location which we love to share with others. We are passionate gardeners, and enjoy the pristine mountain environment we live in. We are both involved in our local community and believe life is found in giving. Anne has poultry which adds to the setting as they wander through the gardens. We wanted to developed something that was more than just accommodation but an experience that will last and be shared. Anne and I do all our own maintenance and cleaning to ensure the highest standard. shady brook is set in an unique spot right on the Ovens river on fertile river flat with very steep mountain taking off at the rear of our property. This has enabled us to develop lush special gardens with a fantastic array of autumn and spring colour, summer also with hydrangeas and dahlias and others also compete in this regard. Its ideally situated for nature based activities all year round. Shady brook 30 km from the top of Mount Hotham Victoria's premium ski centre. you can order all your ski in Harrietville and self drive or take a bus. Shady Brook offers you alternatives for ski stay. Great little cottage with everything you need. Beautiful grounds to go for a stroll on, and only 5 min walk to local bakery, hotel/bar and pizzeria. John was great to deal with, and everything was as described. Would definitely stay again. Shady Brook has been set out amongst magnificent gardens with spectacular all year colour our spring and autumn colour is to seen to believed. We are set on the Ovens River and surrounded by state forest secluded and quiet yet only .5km from the local bakery and hotels. It is the ideal place for just relaxing listening to the birds and the mountain stream right near your accommodation. If you are into nature based activities we are virtually head of trail for two of the most iconic mountain walks up mount feather top. There are also plenty of great short to medium walks to suit all ages most of which are shared with bikes. Then for the road cyclist this is the mecca with rides throughout the Alps. For those who like a different style of adventure to our west are endless four wheel drive tracks out to mountain ridges and down into pristine rivers. There are endless short drives to wineries and restaurants the variety is amazing only 25km from Bright. In winter its the ideal place to stay to enter the ski resorts only 30 kms from Mount Hotham.